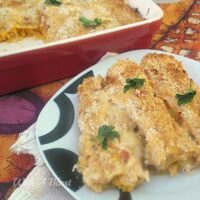 This Creamy Parmesan Pumpkin Cannelloni can easily be served as a meatless dish or as a side dish. I was incredibly surprised at how delicious this turned out. Not only me, but my husband and son were very impressed as well, and that means a lot. 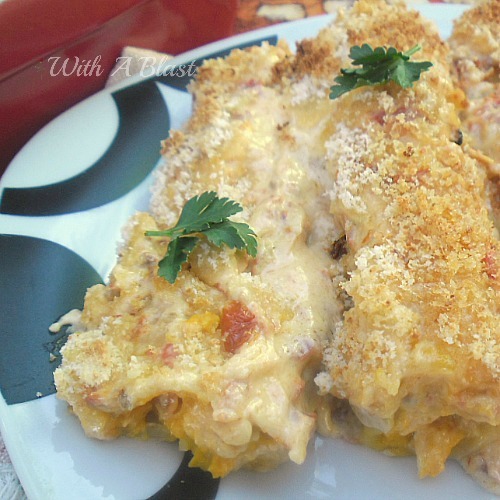 The filling is so creamy with only the slightest bit of crunch with the added chopped Almonds. Oh, and please – do not leave this out ! I think the Almonds made this dish a new favorite with my family. Once baked, the top looked a little dry, but as you can see above, when I pulled the Cannelloni tubes apart all the creamy sauce started to burst out. 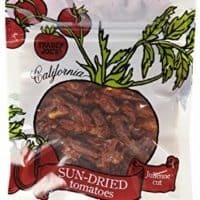 I have to admit it was a first for me to make a tomato based sauce, using Sun Dried Tomatoes. And it won’t be the last – this sauce alone, can be used in so many dishes. Think something like cauliflower with a generous sauce layer and some kind of crunch. Or how about chicken covered in the tomato sauce and then baked to a juicy tender delight ! Do try this recipe for your next Meatless Monday main dish ! It is surprisingly delicious and especially meat lovers would also enjoy this pasta. Serve immediately as a main dish or as a side. Oh I so pinned this! 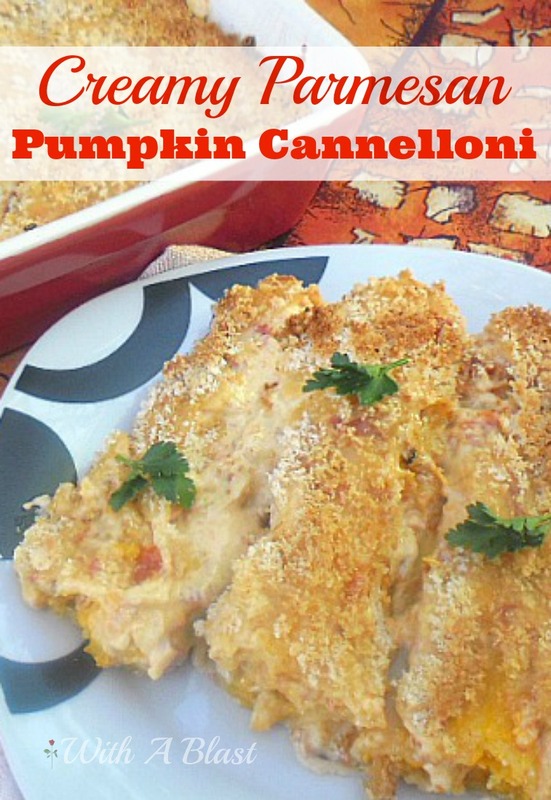 YOu know I love pumpkin and cannelloni, so this is perfect for me and perfect for fall! 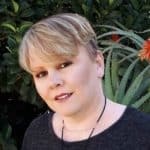 I found you on the Marvelous Monday Linky Party. 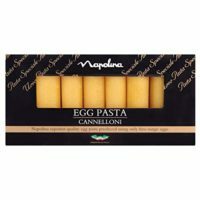 Your pumpkin cannelloni sounds wonderful. Perfect for fall. Creamy pumpkin, yum…you had me there. Pumpkin is one of my favourite veggies, and of course I love pasta too. This recipe sounds amazing. Ahhh Linda! Every week–you never disappoint! This looks delish! Thank you bunches for linking up and partying with us! Yum I still have pumpkin from the garden, do you think I could make a big batch of the filling and freeze it? I'd probably have to do the almond separate the little ones can't eat nuts but the rest of us would love it. Pumpkin paired with pasta is really good. I also like the addition of almonds too. 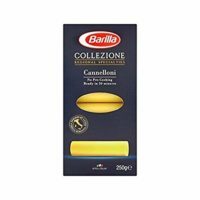 The first dish I ever cooked was cannelloni, so I have a fondness for it. This sounds wonderful! Thanks for sharing with Foodie Friends Friday.